When my oldest son was a little boy, he was shopping with my mother and father and saw something on a display shelf that he wanted. He said so. “I want that, I want that.” My mother explained that you cannot have everything you want, but that we buy what we need. He thought about that for a while and then said, “I need that, I need that.” God knows we need things—material things, friends, spiritual insight and love—and God knows that our true needs do not grow out of selfishness or misplaced craving. We need, though, to discern genuinely between our wants and our needs. For a perfect way to stunt spiritual growth, in Lent or at any time, is to yearn for all the things we want and complain about all the things we do not have. What makes this spiritual discernment particularly difficult is that sometimes we do lack those things that we need, materially, emotionally or spiritually. We must not only discern between want and need; we must maintain trust and hope that God knows our needs and continues to care for us, and will supply our needs. Sometimes events can overwhelm us. During the years when I worked in crisis intervention, I saw that people in crisis, when their lives were falling apart (and often things truly were falling apart), were not able at certain points to perceive God’s action in their lives or the many blessings and gifts they still had. It is important in this spiritual wandering to simply walk alongside people, because how God was working and why God was working in certain ways often become clear only with time and distance. Only with a glance behind us do we see the ways in which what we have been given was precisely what we needed and at the right time, how sufferings have shaped and molded us and how God has watched out for us when we thought we were abandoned. The Samaritan woman, for instance, could not have been expecting some new spiritual awakening when she went to perform the simple task of drawing water. Yet her daily chore of drawing water, as necessary for her life as for the Israelites in the desert, led to her encounter with Jesus, who offers her “living water.” Jesus says that anyone who drinks this water “will never be thirsty. The water that I will give will become in them a spring of water gushing up to eternal life.” Initially, she misunderstands and just wants this water “so that I may never be thirsty or have to keep coming here to draw water.” Ultimately she grasps that what Jesus offers fulfills more than material desires; it is exactly what she and everyone needs. The water Jesus offers, made visible in the sacrament of baptism, leads to eternal life. In grasping this truth, the Samaritan woman recognizes Jesus for who he is, the Messiah, and grasps the truth about God’s knowledge of our ultimate need. 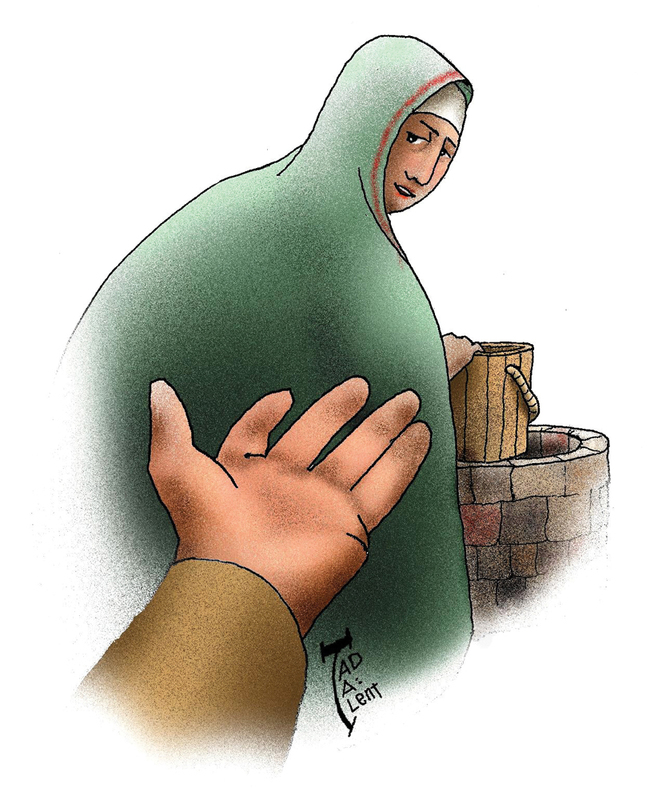 The Samaritan woman might have been considered on many counts unworthy of Jesus’ visitation, but God has come to her, a woman (which astonishes his own disciples), a Samaritan and someone who had been married five times. But her life had prepared her for this meeting, to become the voice of Jesus among her people. When we are prepared for the “living water” to become what we want, despair is banished and we have all that we need. This article also appeared in print, under the headline "Away With Despair," in the March 17, 2014 issue.